With the holiday season bursting through the door and literally right around the corner it is time to start shopping and hit the stores hard to stock up on gifts, presents and holiday decor! As a Mom of four on a budget I want to save as much money as possible while shopping so that we get more out of our money. In 2007 while pregnant and shopping on a very tight budget we met and fell in love with EBATES! Ebates is an online shopping portal site where users sign up in as little as five minutes in just a few simple clicks and begin shopping, earning and saving! Ebates has two different features and they work together in unison to maximize your savings. 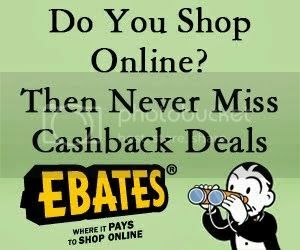 Once you create an account you are taken to Ebates homepage where you can browse through today’s double cash back deals, hot stores, and exclusive online coupon codes. Find a coupon or store you are interested in, click on it, you are instantly transferred to the store WITH coupon code and earnings already applied. Nothing more for you to do! For instance, say I want to shop at Target, I click on the link and Ebates automatically transfers me to Target.com to start shopping. As of today the current cash back earnings for Target is 4.0%. After I complete my checkout, my earnings are automatically in the Ebates system and pending. Simple as that, easy right? Those of us that shop online it truly does save us money by using the coupons and earning cash back, where else can you do that? Now if you really want to start saving you could earn even more cash back as you double team and earn from Ebates AND your awards using your credit card, it adds up, and quick! Every 3 months, Ebates will send you a cash back payment for purchases posted during the previous quarter based on their set schedule. But if you have earned less than $5.01 cash back, they will carry over your money to the next quarter.You can get your cash back in three different methods. Big Fat Check: Ebates will send a check directly to you – mailing fees are on them. Be sure your settings are updated before they send out a payment to be sure you get your money. PayPal: Ebates will deposit your payment in your PayPal account – sender’s fees are on them. Just enter your full name and mailing address into your Address, Email & Password page for verification purposes. Your PayPal account must also be verified. Charity/Organization/Family Member: If you think cash back is all gravy, why not send it to your favorite charity, organization or family member? It’s free and mailing fees are on Ebates. Go to the Cash Back Method to send your cash back to a charity, organization or family member. Sounds amazing right? Since we joined in 2007 we have earned a total of $1,179. We have used over 30 exclusive Ebates coupons and taken advantage of the endless free shipping deals simply by shopping through Ebates! With the holiday’s right around the corner, now it’s your turn to start earning cash back and racking up the big fat checks! It is literally a handful of simple clicks to get started. Start saving now to take advantage of the huge cash back savings rolling in daily. Click HERE to sign up and Start earning cash back! Will you be joining today? If you are already a member, how much have you earned since joining? neat site, thanks for your contests! Ebates is a great program for people that do a lot of online shopping. I have been a member for several years. It’s awesome. I’ve heard great things about ebates. I have no idea why but I keep forgetting to sign up. This is the perfect time to join ebates. I need to use mine more often! I haven’t used Ebates in forever. I’ll definitely need to revisit it. I tried using it, but for some reason, I stopped. I need to get back on, it sounds awesome! Ebates huh! I’ve heard about, but never found time to check it out, and see what it’s all about. Gonna have to do that. I love both ebates and FatWallet – great post on showing people how to use the platform! I have to look into this. I’ve heard of Ebates, but never really understood what it was about. I shop so much on line, it’s time for me to join up! Wow – this is cool. I’ve heard of ebates, but didn’t know what it is all about – this is a great explanation!!! Love earning cash back for things. I know they don’t happen right away but when it’s time to cash it in, it’s great! I love Ebates! There is nothing better then making money for doing something you are already doing. I love when I see that Big Fat Check. I do belong to Ebates and I like getting paid to shop. Love ebates, especially during xmas time. Saves me so much on all the gifts I need to buy! I just checked it out tonightt and am seeing some great deals! I love Ebates! I have been using it ever since it came out many years ago. Sounds great! If only I lived in the States! Ok ok… I did it. I signed up. I gave in. Now I will wait to see the savings. Thank you. eBates is a very good site for saving money and getting cash back rewards. I have been a member for years. Ebates is such a great site! They have such great deals all year long! I’ve heard a lot about Ebate’s, I really need to look into it. I believe my sister uses Ebates and it’s been around for quite awhile. I do shop online a lot, sounds like a great deal. I will look into this a little more and maybe I will join. I’ve been a member for a while and will probably use Ebates for holiday shopping. I need to sign up for this, I meant to but keep forgetting. Thanks for the reminder especially with Christmas coming! I shop online A LOT. I really should be signed up with Ebates to save! This sounds totally awesome! Would definitely check this out. I have looked at EBates and its a great site I am watching for deals right now. Its great for Holiday shopping. That’s a great deal for ebates! How can you lose if you shop? I just signed up a few weeks ago, was the perfect time, ready for the holidays! I signed up for ebates awhile ago but since I don’t so online shopping I haven’t had a chance to see what I would save. but I do think for these Christmas shopping I should use it. I have joined just recently, but I have not used Ebates yet. I have heard a lot of great savings and money back on eBates. I keep forgetting to use it. Been a member for years. I dont shop online but this would be great for my daughter – in – law who does . thanks for the information on it. I love Ebates, especially around his time of year.